Class judging at Pebble Beach is based on points, including authenticity, but there is also an "elegance factor" of about 10% that the judges can use to determine the winners if the judges feel the cars are otherwise equal. ... . Of course the overall look of a car is important there, but I clearly recall that the chief judge also made it clear that if the car is otherwise fantastic, you can't let your personal like or dislike of some aspect or accessory get in the way. Thanks for the input on Pebble Beach judging, Dave. However, the above statement has me confused. How does one judge the "elegance factor" without inserting personal views? What is elegant to me (black tires, no extra lights, no trunk, monotone colors, etc.) may not be elegant to my judging partner (or the car owner). Which also brings about another question, "Is good styling (or taste) quantifiable???" Also, you are absolutely correct that subjective judging is NOT consistent.... BUT, it is not intended to be. Assembling a qualified judging team such as they do at Pebble Beach is impossible for the smaller shows, so some "celebrity" judge can easily be put into a position where he's "judging" a class he knows nothing about. But, he doesn't have to know anything about the cars, because it's purely subjective. It is unfortunate that the person you heard didn't pay attention during the judges' meeting, where he would have learned he's only to pick what he likes. 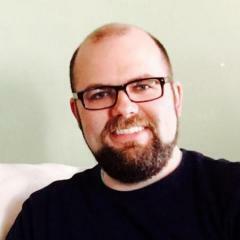 He doesn't have to judge for authenticity, condition, correctness, etc. One good thing about objective judging (or "walk by" judging, as you put it), is that it can take into account mistakes made by the original owner. If a car was originally delivered with pink and yellow clown colors, white sidewall tires, ten lights on the front (including two spot lights, a running board light, two fender or cowl lights, two head lights, two pilot ray lights and a Trippe Light), and a big trunk in the back, that doesn't make it elegant based on being correct. It was probably thought to be in poor taste then, as it would be today. What was the OP's original question again??? :cool: Oh yes, lights. I think if I had a set of Trippe Lights on my car, I'd bring that original documentation with me to an AACA show, just in case a judge rightfully questioned them. I believe CCCA accepts them, but an AACA judge would be correct in questioning them, especially on a Packard built after 1932. Dave Michell and others. I have a 1933 Packard Victoria convertible (Dietrich) with Trippe lights with the bubble balancers. See pictures. Don't know if original. My 1935 Auburn has driving lights, but seem nothing fancy. Since the Auburn was a lower priced car it may have come with these(?) If so, should I keep them or upgrade to Trippe lights? I like the Trippes better. But the Auburn lights are rounded forward, like the headlights. Does match very well. ?? I would like to add driving light(s) to my 1920 Cadillac Phaeton. What would be appropriate? Probably not chrome as chrome was added to cars in 1924. Would I be looking for nickle, brass, or painted steel? Should I look for one or two ovals? What is a "ditch light"? 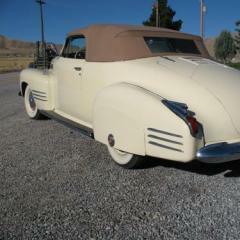 The Trippe Lights on your Packard are non original and were never a factory authorized accessory on any car. Nevertheless a lot of folks like them, me included. +1. The Auburn's are in the factory accessory catalog. Of course, that wouldn't stop me from taking them off my Auburn either :). Neither the Trippe lights or the driving lights were a factory authorized accessory. Pilot Rays were a factory authorized accessory for the 31-33 cars but will not fit on the 34-36 Auburns. Curt, I'm talking about the smaller ones like what go on the Cord 810/812 and are definitely in the Cord catalog. Am I wrong that 35/36 Auburn didn't have them too? I would like to add driving light(s) to my 1920 Cadillac Phaeton. What would be appropriate? produced cars that were lithe, graceful, and often colorful. I don't think any styling has surpassed that era's. of your particular car, you may want to reproduce its original appearance. your car is "missing" something that you have to add! AJ., yes 810-812 Cords did have the small driving lights, but not Auburn. I do not know about other people but I do not live in the city so I have no street lights out here in the boonies. You want to try and a drive a 1930s car after dark with no driving lights out in the country. I did switch over to halogen but the driving lights are staying on. Interesting comments from all. The earliest period photograph I have of Trippe lights with the curved brackets is 1938, and as Dave refers to , this is on a Derham bodied car - the one I have the photo of is a town car. It is noted correctly that Trippe lights with a straight mounting bracket is shown in the 1932 Accessories catalog offered by Packard and was mounted on the round bar between the chassis frame. Saf - De - Lites ; look to a future issue of the CCCA magazine for an article on these I have researched their history. I am mounting a pair on my 733 seven passenger touring (similar car as Marty's) and they are shown in the accessory catalogs offered by Packard from 1923 thru 1930. These are beautifully made lights and were available in nickel, then chrome, and then chrome(rim) and painted body shell. The 1936 and up senior Packard's used a smaller lamp that had a amber lens, and vertical ribs. (these look very much in style like the accessory driving lamps used by Cord for the 810/812) These were made by Unity and Packard bought them and riveted their emblem at the top. I owned a totally original 1937 Super 8 limousine that was bought new by F.X. Matt of Utica, NY who owned a brewery there, it had the Packard/Unity lights on it since new and when I acquired other similar lamps made by Unity and compared them they were exactly the same including the casting number in the lens. This is not the same Unity driving lights that you see offered for sale today with the tab at the top, totally different lights. 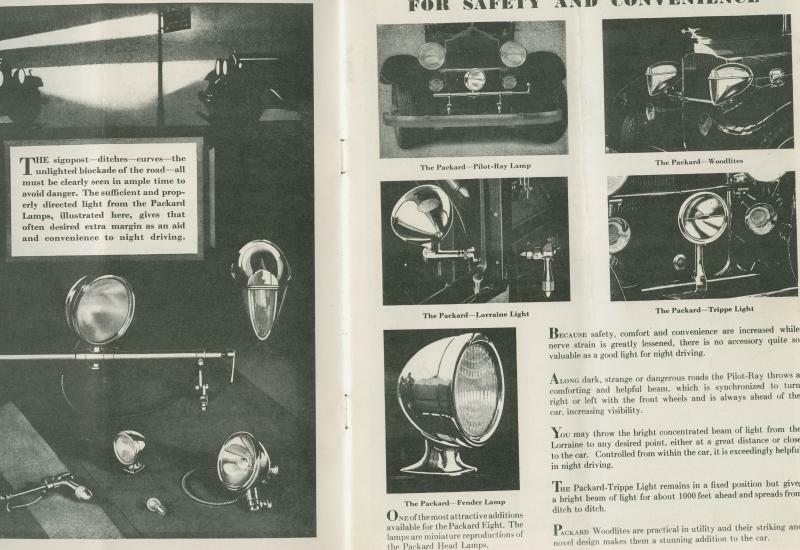 Trippe lights with a straight mounting bracket is shown in the 1932 Accessories catalog offered by Packard . Walt, can you scan in the page of the 32 Packard accessories depicting the Trippe Lights and post it here ? I know this is an old thread, but the first response was not quite accurate. 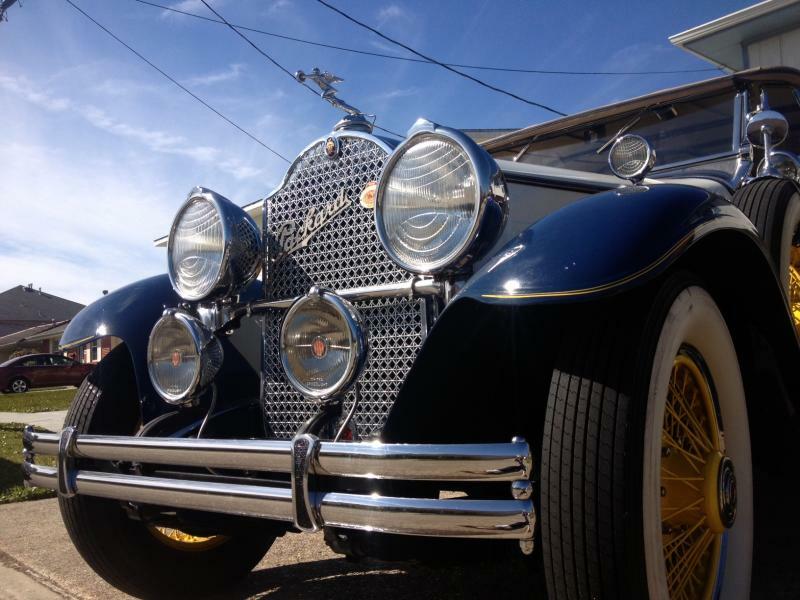 Lorraines were not just cowl spots, but were also available as fog lights and driving lights. While spots may have have been their bread and butter, the company made all three. Cord, Thanks for the link! I have yet to see any factory literature that indicates Trippe Lights are an authorized accessory. The Trippes we normally associate with the name, meaning the large lights with the curved mounting brackets and levels were never an authorized accessory on any car. 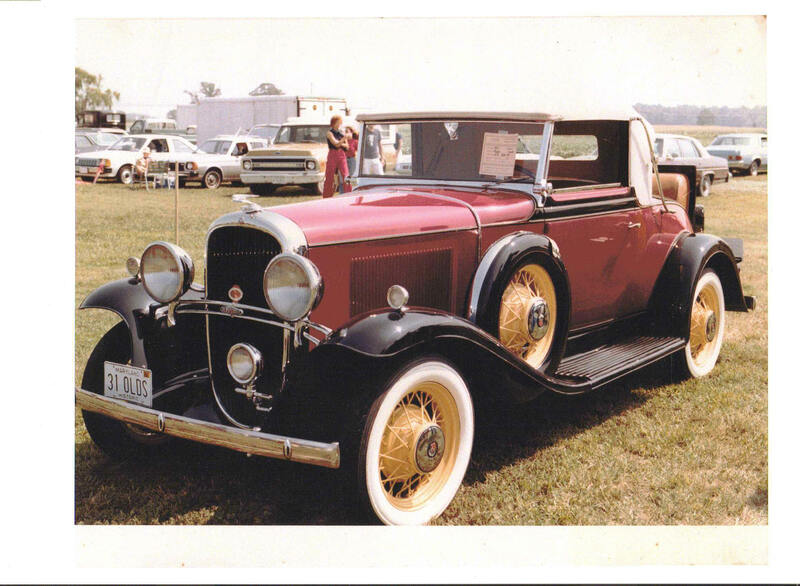 AACA has grandfathered them in since so many early restorations chose to add them. That is a shame ! Yes it is though I must say I like them on some cars. Oh Ya, I like them too. But to grandfather in incorrect accessories because the guys that are doing the grandfathering have them on their own cars is a step in the wrong direction. Where does it end ? Raise the bar ! I agree totally. My background is in archaeology and it does history a disservice to claim a car is "restored" when it isn't. I know we are not talking about irreplaceable Egyptian artifacts here but history is history. Here are the pages from the 1932 Packard catalog showing the single Trippe accessory with the straight mount. 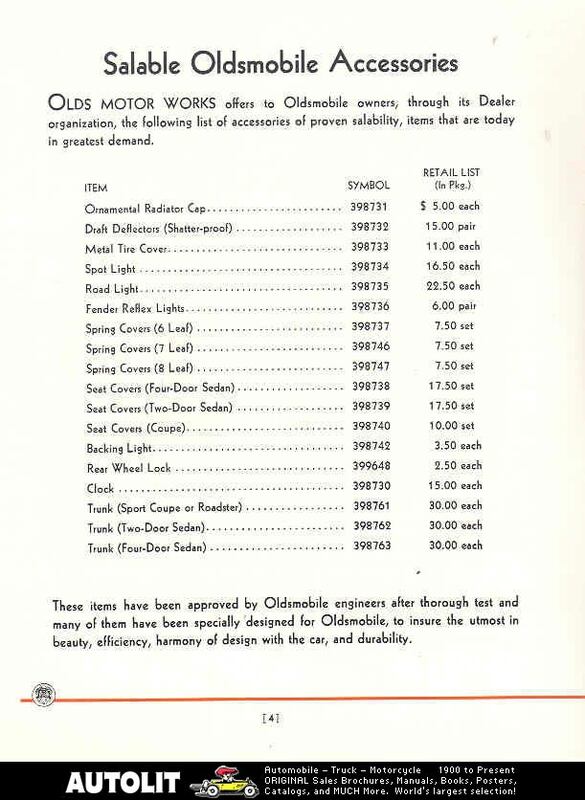 I drive two of my cars extensively -- for example on Glidden Tours -- and found that they are just too dangerous at night without the extra lights, despite modern bulbs and replated reflectors in the stock headlights. My '29 Packard has a single Pilot Ray light, and my '35 Auburn has twin Tripps. These make quite a difference. Oddly enough, the best lights on my cars are the giant drums on the 1919 Locomobile. I always wondered if those Woodlites actually give enough light to be useful. I've been told they're quite bright if/when restored properly.